Objectives: To investigate the value of Mean Platelet Volume (MPV) in predicting immediate angiographic myocardial reperfusion and short-term Major Adverse Cardiac Events (MACE) in primary Percutaneous Coronary Intervention (PCI) patients. Background: Impaired immediate angiographic reperfusion is a common complication in patients of ST-Elevation Myocardial Infarction (STEMI) treated by primary PCI, which carries an increased risk of further development of MACE. MPV-which is an indicator of platelet reactivity-may play an important role in occurrence of such complications. Patients and Methods: The study included 130 patients with acute STEMI who were treated by primary PCI. MPV was measured on admission. Angiographic assessment of Thrombolysis in Myocardial Infarction (TIMI) flow grade, with further assessment of myocardial reperfusion by Myocardial Blush Grade (MBG) in those with TIMI III flow. Patients were followed-up to six months for occurrence of MACE. Results: Patients with high MPV had a significant reduction in their TIMI flow and MBG (p=0.001), with higher incidence of MACE (p<0.0001). MPV showed a negative correlation with TIMI flow (p=0.006) and MBG (p<0.0001), and a positive correlation with MACE (p<0.0001). MBG also showed a negative correlation with further development of MACE (p=0.003). Regression models in such patients expressed MPV as an independent predictor for both MBG (p=0.008) and MACE (p<0.0001), with ROC curve analysis revealed that MPV values ≥10.45 fl and ≥10.95 fl could predict poor MBG (sensitivity=76%, specificity=75%, AUC=0.790 and MACE (sensitivity=91%, specificity=84%, AUC=0.956) respectively. Conclusions: MPV can predict immediate angiographic myocardial perfusion and short-term MACE in primary PCI patients. Primary Percutaneous Coronary Intervention (PRIMARY PCI) has become the recommended modality of treatment in patients with acute ST-elevation myocardial infarction, especially those presented at the optimum time-window, or those who developed serious complications as cardiogenic shock or heart failure . Impaired immediate angiographic myocardial reperfusion is still one of the common complications in such patients treated by primary PCI. It may be attributed to many factors that affect coronary microvasculature as distal embolization of small platelet aggregates, release of vasoconstrictor mediators or direct platelet-leukocyte interaction with vessel wall, with subsequent release of many chemical mediators that promote local inflammatory response . Mean Platelet Volume (MPV) has been correlated with platelet reactivity and expression of its receptors. Increased MPV was associated with the occurrence of acute myocardial infraction, restenosis, cardiovascular events and mortality, even after adjusting for platelet count [3,4]. The rationale of our study was to test the hypothesis that the admission MPV may play a possible rule in achieving optimum immediate angiographic results and true myocardial reperfusion in patients treated with primary PCI, which may influence further development of short-term Major Adverse Cardiac Events (MACE) in such patients. Thirty-two patients were excluded from the study [15 patients with renal impairment, 5 patients with low hemoglobin level, and 12 patients with coronary lesions that require urgent surgical intervention]. One hundred and thirty patients met the study criteria. They were classified into two groups according to their mean admission MPV, group I: with high MPV (≥ 11.5 fl) and group II: with normal MPV (7.5-11.4 fl). On admission; after confirming the diagnosis of acute STEMI by history, clinical examination, standard 12-lead ECG and serial cardiac enzymes, a peripheral venous blood sample were drawn from included subjects for complete blood picture and MPV. Blood samples were taken into standardized tubes containing "Ethylenedinitro Dipotassium Tetra-acetic Acid" stored in room temperature, and all measurements were performed within 30 minutes after blood collection. This was made before administration of heparin, dualantiplatelet therapy (aspirin and clopidogril), and glycoprotein IIb/IIa (GP IIb/IIIa) inhibitors if indicated. Normal range of MPV was defined to be 7.5-11.4 fl . The included subject also had trans-thoracic echocardiography to assess resting wall motion abnormalities and cardiac functions, or any mechanical complications that may require urgent surgical intervention. Angiographic analysis: Angiographic analysis was done by at least two expert angiographers. In each case; primary PCI has been performed using Seldinger’s technique through trans-femoral approach, and stenting was undertaken using drug-eluting stents to the culprit lesion. Thrombolysis in myocardial infarction flow grade was assessed, where TIMI 0 flow (no perfusion)=absence of any antegrade flow beyond a coronary occlusion, TIMI I flow (penetration without perfusion)=faint antegrade coronary flow beyond the occlusion, with incomplete filling of the distal coronary bed, TIMI II flow (partial reperfusion)=delayed or sluggish antegrade flow with complete filling of the distal territory, and TIMI III flow (complete reperfusion)=normal flow which fills the distal coronary bed completely. (8). Myocardial blush Grade scoring was then applied to those with TIMI III flow to assess their myocardial reperfusion, whereas MBG 0=no myocardial blush or contrast density, MBG 1=minimal myocardial blush or contrast density, MBG 2=moderate myocardial blush or contrast density but less than that obtained during angiography of a contralateral or ipsilateral noninfarct- related coronary artery MBG 3=normal myocardial blush or contrast density, comparable with that obtained during angiography of a contralateral or ipsilateral non-infarct-related coronary artery. MBG 0/1 indicated impaired microvascular and myocardial reperfusion and MBG 2/3 indicated good microvascular and myocardial reperfusion [8,9]. Adjunctive pharmaco-therapy: Loading dose of acetyl-salicylic acid (300 mg) and clopidogril (300 mg), full anti-ischemic medication including beta blockers, nitrates heparin. GP IIb/IIIa inhibitors were administrated during PCI in cases with high thrombotic burden. Follow up: Patients were followed up monthly for 6 months to detect any MACE, by history taking, clinical examination and 12-lead ECG, cardiac enzymes, routine laboratory work and transthoracic echocardiography in the first, third and six-month follow-up visits. MACE were defined as occurrence of any of the following: reinfarction or ACS requiring undergoing revascularization, hospitalization due to congestive heart failure, cardiogenic shock or malignant dysrhythmia, mechanical complications of myocardial infarction and/or mortality from previously enumerated cardiac causes . Statistical analysis: It was performed using Statistical package for the social sciences software, version 16.0 for Windows (SPSS Inc., Chicago, Illinois, USA). Descriptive statistics of range mean and SD were calculated for interval and ordinary variables, and correlations (bivariate correlations procedure computes Spearman rho correlation coefficient with its significance levels. Student’s t-test compared the difference between the two groups’ means in interval and ordinal variables. Stepwise regression analyses were applied to test the independent prediction for TIMI flow, MBG and MACE. The Receiver Operating Characteristic (ROC) and Area Under Curve (AUC) presented along with its 95% Confidence Interval (CI) were obtained in order to measure the overall performance of a diagnostic test, and the operating point at which best sensitivity and specificity were obtained. p value<0.05 was considered as statistically significant. The study included 130 STEMI patients treated by primary PCI, 112 (86%) were males, with mean age of 52 ± 9 years old. Among the enrolled patients; 54% were diabetic, 42% were hypertensive, 60% were dyslipidemic, 88.5% were smoker and 32% had family history of premature Coronary Artery Disease (CAD). They were classified into group I: which included 60 cases (46%) with high MPV and group II: which included 70 cases (54%) with normal MPV. There was no significant difference between both groups regarding age, gender, incidence of risk factors for CAD, basic renal function tests and electrolytes, cardiac enzymes and markers [troponin-I, creatinine kinase-mb (CKmb) high sensitivity C-reactive protein (hs-CRP)], neutrophils/lymphocytes (N/L) ratio, localization of infarction by ECG, echocardiographic left ventricular wall motion score and ejection fraction (EF%), pain to balloon time, the culprit vessel involved, and adjunctive GP IIb/IIIA inhibitor administration (Table 1). Table 1: Comparison between patients with high MPV (group I) and those with normal MPV (group II). MPV: Mean Platelet Volume; DM: Diabetes Mellitus; CAD: Coronary Artery Disease; CKmb: Creatinine Kinase-mb; hs-CRP: high sensitivity C Reactive Protein; EF%: Ejection Fraction; GP: Glycoprotein. Regarding immediate angiographic data in both groups; there were significantly lower incidence of TIMI-III flow in group I compared to group II (76.7% vs. 97.1%, p=0.001). Moreover; in those who had TIMI-III flow, there were higher incidence of MBG 0/1 (60.9% vs. 13.2%, p=0.001) and lower incidence of MBG 2/3 in group I compared to group II (39.1% vs. 86.8%, p=0.001) (Table 2). In 6-month follow up of study population, there was significantly higher incidence of MACE in group I compared to group II (41.6% vs. 1.4%, p<0.0001) (Table 2). Table 2: TIMI flow grade, MBG and MACE in patients of both groups. TIMI: Thrombolysis in Myocardial Infarction; MBG: Myocardial Blush Grade; MACE: Major Adverse Cardiac Events; MR: Mitral Regurgitation; ACS: Acute Coronary Syndrome. Table 3: Correlation between MPV with clinical risk factors, TIMI flow grade, MBG and MACE. MPV: Mean Platelet Volume; DM: Diabetes Mellitus; CAD: Coronary Artery Disease; TIMI: Thrombolysis in Myocardial Infarction; MBG: Myocardial Blush Grade; MACE: Major Adverse Cardiac Events. ROC curve for MPV in predicting TIMI flow and MBG revealed that MPV ≤ 11.05 fl could predict TIMI-III flow grade (sensitivity=79%, specificity=79%, AUC=0.768), while MPV ≥ 10.45 fl could predict poor MBG (sensitivity=76%, specificity=75%, AUC=0.790). ROC curve analysis for MPV in predicting MACE also revealed that MPV ≥ 10.95 fl could predict the occurrence of MACE (sensitivity=91%, specificity=84%, AUC=0.956) (Figure 1). Figure 1: ROC curve analysis of MPV in predicting TIMI flow grade (left panel), MBG (middle panel) and MACE (right panel). In the current study; primary PCI patients with high admission MPV had higher incidence of impaired TIMI flow grade, and even those with TIMI-III flow showed poor immediate myocardial perfusion (MBG 0/1) than those with normal MPV. They also had higher incidence of MACE in 6-month follow-up. High MPV was strongly correlated with poor immediate myocardial perfusion and occurrence of MACE, with observed correlation between poor immediate myocardial perfusion and the later on occurrence of MACE. MPV could independently predict TIMI-III flow and poor myocardial perfusion in immediate angiographic results, by cut-off values ≤11.05 fl and ≥10.45 fl respectively with accepted sensitivity and specificity. MPV could also independently predict occurrence of six- month MACE by cut-off values ≥10.95 fl with accepted sensitivity and specificity. The MPV was significantly higher in patients with acute coronary syndromes (ACS) compared to normal population . In the context of non-STEMI patients; Taskesen et al. observed that patients with angiographically significant CAD had higher MPV and MPV/platelet count (PC) ratio. Although high MPV and troponin were independent predictors for significant CAD by multivariate analysis, those with high MPV and high troponin level demonstrated a 4.8-fold increased risk for significant CAD compared to those with normal MPV and high troponin (odds ratio 4.8, 95% confidence interval 1.31 to 17.6, p=0.001). They concluded that high MPV could give better screening for significant CAD and determine those need cardiac catheterization in non-STEMI patients. Nevertheless; when Kiris et al. studied the relation between MPV and 1-year mortality post non-STEMI, admission MPV was comparable in survival and non-survival groups, while later MPV (after 24 hours) and change between admission and later MPV (Δ MPV) were higher in non-survivors, and Δ MPV appeared as an independent predictor for total mortality by multivariate analysis (OR: 1.84, 95% CI: 1.28-2.65, p=0.001). They recommended that non-patients with such change in MPV may need more effective antiplatelet therapy. Meanwhile; MPV gained much more importance in STEMI patients, as Ahamed et al. showed that MPV was significantly higher in STEMI patients compared to those of non-STEMI (10.3 ± 0.8 vs. 9.2 ± 0.5, p<0.05), also in those with three-vessel disease compared to those with two-vessel disease (10.0 ± 0.9 vs. 9.2 ± 0.7, p<0.05). Those results confirmed the role of larger platelets in developing coronary thrombosis in context of acute STEMI, being haemostatically more active. Similar results to ours were observed by Huczek et al. who studied MPV in STEMI patient treated with primary PCI. High MPV was associated with a higher incidence of no-reflow and had a strong correlation with TIMI frame count. MPV had also shown an independent prediction for no-reflow phenomenon and 6-month mortality. Interestingly; Abciximab administration showed significant reduction in mortality at high MPV patients, being at higher risk for thrombosis so benefits from Abciximab were maximum. Lai et al. had demonstrated a strong association between admission MPV and angiographic large thrombus burden and 30-day all-cause mortality in primary PCI patient. MPV could independently predict angiographic large thrombus burden, with cutoff value ≥ 10.2 fl (73.5% sensitivity and 68.9% specificity). They concluded that MPV may be a useful biomarker for risk stratification of such patients. In a study conducted by Akgul et al. for studying the prognostic value of MPV in post STEMI patients, patients in the highest admission MPV tertile (>8.9) had higher 6-month all-cause mortality, and the admission MPV value was a powerful independent predictor of 6-month all-cause mortality. Although such MPV values were relatively low and may lie within normal-range values, but those findings gave a proof on the prognostic value of MPV. Also and in concordance with our results; in a study conducted by Goncalves et al. for testing the usefulness of MPV as a biomarker for long-term adverse CV outcome post PCI, patients in the highest tertile (MPV>9.1 fl) had an increased frequency of adverse CV outcomes (p<0.01). Diabetes and high tertile MPV were demonstrated as the best predictors of adverse outcomes by logistic regression. Moreover; although Tian et al. 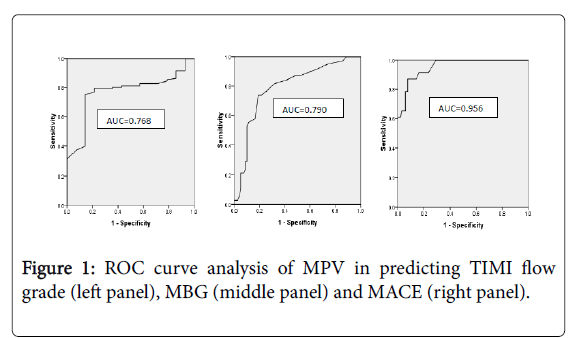 demonstrated similar usefulness of MPV in predicting long-term adverse outcomes in patients with STEMI undergoing primary PCI, they observed that MPV/PC ratio may had better accuracy for predicting MACE than admission MPV (MPV/PC ratio vs. MPV: z=2.285, P=0.022). Nevertheless; contradictory results were obtained by Shafiee et al. who conducted a large retrospective study on elective PCI cohort, with the primary endpoint was the incidence of MACE. Patients were categorized into three groups according to pre-procedural MPV tertiles. High MPV was a borderline predictor for MACE (HR=0.26, 95% CI: 0.98-2.68, p=0.057), which was significantly associated with older age, hypertension, diabetes mellitus, previous CABG and lower serum triglyceride. Probably such contradiction may be due to heterogeneity of the study population which has various pathophysiologic mechanisms for CAD and indications for elective PCI. In agreement with our results; Sarli et al. studied coronary microvasculature and myocardial perfusion by evaluating postinterventional MBG with TIMI-III flow in primary PCI patients-had observed that patients with poor MBG had higher admission MPV (10.5 ± 1.3 to 9.1 ± 1 fl, p<0.001), CV mortality (13-5%, p=0.013) and acute/subacute stent thrombosis (12-8%, p=0.028) than those with good MBG. Regression analysis also showed that admission MPV was significantly associated with post-interventional MBG (CE=0.598, p<0.001). In another study conducted by Lai et al. studying MBG after successful epicardial reperfusion by primary PCI, MPV was significantly higher in patients with MBG 0/1 than in patients with MBG 2/3 (10.38 ± 0.98 fl vs. 9.59 ± 0.73 fl, p<0.001). The cumulative 30-day all-cause mortality rate were also significantly higher in those with high MPV and MBG 0/1 (6.8% vs. 1.5%, p=0.005, 7.6% vs. 1.9%, p=0.006 respectively). Multivariate regression analysis similarly demonstrated MPV independent association with post-interventional impaired myocardial reperfusion (p<0.001) and 30-day all-cause mortality (p=0.046). From the previously discussed data we could observe that large platelet size was closely associated with its activity at the onset of the thrombotic event, which could play a pivotal role in determining further revascularization success and immediate angiographic results. Effective flow restoration at the epicardial vessels was not enough to judge perfect angiographic outcome after primary PCI, as restoring good myocardial reperfusion is the main target of this timelyperformed procedure, and poor myocardial perfusion-even with excellent flow restoration at epicardial vessels-may be the main predictor of occurrence of later on adverse CV outcome. Admission MPV-which is an index for platelet reactivity-, appeared as a helpful tool for predicting perfect immediate angiographic outcome and myocardial reperfusion, and occurrence of short-term adverse CV events and mortality in ACS patients, especially those who will be scheduled for primary PCI. Admission MPV may express a clinical significance in predicting immediate angiographic outcome and short-term MACE in acute STEMI patients treated with primary PCI, being a simple laboratory tool that can predict not only flow restoration in the epicardial vessel but also true myocardial reperfusion, that may influence further occurrence of short-term adverse outcome and mortality. Awareness by the presence of high admission MPV in such patients may necessitate application of more intense antiplatelet strategy in order to prevent no-reflow phenomenon and improve their outcome and prognosis. Further studies may be needed to test the optimum medical treatment protocol, the novel antiplatelet drugs, and the optimum dosage needed that could target such high MPV and reactivity in those patients. Larger sample size may be needed to increase the statistical power of the results. Lack of community awareness and late presentation of patients after the onset of pain may stand behind the small sample size in our study. Angiographic follow-up of the study population may be useful in recognizing the impact of MPV on the long-term state of myocardial perfusion. The study protocol was approved by the “Institutional Ethical Committee/Reviewing Board of Minia University-Faculty of Medicine”, and was in accordance with “the World Medical Association Declaration of Helsinki” and subsequent amendments. Ibanez B, James S, Agewall S, Antunes MJ, Bucciarelli-Ducci C, et al. (2017) 2017 ESC Guidelines for the management of acute myocardial infarction in patients presenting with ST-segment elevation: the task force for the management of acute myocardial infarction in patients presenting with ST-segment elevation of the European Society of Cardiology (ESC). Euro Heart J 39: 119-177. Yellon DM, Hausenloy DJ (2007) Myocardial reperfusion injury. N Eng J Med 357: 1121-1135. Park Y, Schoene N, Harris W (2002) Mean platelet volume as an indicator of platelet activation: methodological issues. Platelets 13: 301-306. Klovaite J, Benn M, Yazdanyar S, Nordestgaard BG (2011) High platelet volume and increased risk of myocardial infarction: 39,531 participants from the general population. J Thromb Hemostat 9: 49-56. Gasparyan AY, Ayvazyan L, Mikhailidis DP, Kitas GD (2011) Mean platelet volume: a link between thrombosis and inflammation. Curr Pharm Des 17: 47-58. Gawaz M, Langer H, May AE (2005) Platelets in inflammation and atherogenesis. J Clin Invest 115: 3378-3384. Demirin H, Ozhan H, Ucgun T, Celer A, Bulur S, et al. (2011) Normal range of mean platelet volume in healthy subjects: insight from a large epidemiologic study. Thromb Res 128: 358-360. TIMI Study Group (1985) The thrombolysis in myocardial infarction (TIMI) trial. phase I findings. N Eng J Med 312: 932-936. Haager PK, Christott P, Heussen N, Lepper W, Hanrath P, et al. (2003) Prediction of clinical outcome after mechanical revascularization in acute myocardial infarction by markers of myocardial reperfusion. J Am Coll Cardiol 41: 532-538. Kip KE, Hollabaugh K, Marroquin OC, Williams DO (2008) The problem with composite end points in cardiovascular studies: the story of major adverse cardiac events and percutaneous coronary intervention. J Am Coll Cardiol 51: 701-707. Ahamed H, Henry RA, Pai R (2017) Association of mean platelet volume and acute coronary syndrome. IJRMS 5: 1217-1220. Taskesen T, Sekhon H, Wroblewski I, Goldfarb M, Ahmad MB, et al. (2017) Usefulness of mean platelet volume to predict significant coronary artery disease in patients with non-ST-elevation acute coronary syndromes. Am J Cardiol 119: 192-196. KırışT, Yazici S, Günaydin ZY, Akyüz S, Güzelburç O, et al. (2016) The Prognostic Impact of In-Hospital Change in Mean Platelet Volume in Patients With Non-ST-Segment Elevation Myocardial Infarction. Angiology 67: 690-696. Huczek Z, Kochman J, Filipiak KJ, Horszczaruk GJ, Grabowski M, et al. (2005) Mean platelet volume on admission predicts impaired reperfusion and long-term mortality in acute myocardial infarction treated with primary percutaneous coronary intervention. J Am Coll Cardiol 46: 284-290. Lai HM, Xu R, Yang YN, Ma YT, Li XM, et al. (2015) Association of mean platelet volume with angiographic thrombus burden and short-term mortality in patients with ST-segment elevation myocardial infarction undergoing primary percutaneous coronary intervention. Catheter Cardiovasc Interv 85: 724-733. Akgul O, Uyarel H, Pusuroglu H, Gul M, Isiksacan N, et al. (2013) Prognostic value of elevated mean platelet volume in patients undergoing primary angioplasty for ST-elevation myocardial infarction. Acta Cardiol 68: 307-314. Goncalves SC, Labinaz M , Le May M, Glover C, Froeschl M, et al. (2011) Usefulness of mean platelet volume as a biomarker for long-term outcomes after percutaneous coronary intervention. Am J cardiol 107: 204-209. Tian C, Song J, He D, Wu J, Sun Z, et al. (2018) Predictive value of mean platelet volume/platelet count for prognosis in acute myocardial infarction. Int Heart J 59: 286-292. Shafiee A, Nozari Y, Parsa M, Jalali A (2017) Mean platelet volume and major adverse cardiac events following coronary angioplasty. Euro Heart J 38 (1): 496-501. Sarli B, Baktir AO, Saglam H, Arinc H, Kurtul S, et al. (2013) Mean platelet volume is associated with poor post interventional myocardial blush grade in patients with ST-segment elevation myocardial infarction. Coron Artery Dis 24: 285-289. Lai HM, Chen QJ, Yang YN, Ma YT, Li XM, et al. (2016) Association of mean platelet volume with impaired myocardial reperfusion and short-term mortality in patients with ST-segment elevation myocardial infarction undergoing primary percutaneous coronary intervention. Blood coagul Fibrinolysis 27: 5-12. Citation: Farrag HMA, Aziz SF, Amin AS, Abdel-Rahman TM (2019) Can Mean Platelet Volume Truly Predict Successful Angiographic Myocardial Reperfusion?. J Clin Exp Cardiolog 10: 626. Copyright: © 2019 Farrag HMA, et al. This is an open-access article distributed under the terms of the Creative Commons Attribution License, which permits unrestricted use, distribution, and reproduction in any medium, provided the original author and source are credited.